Wow, this week went by fast! I’ve had several people say this to me as the week came to a close. I think it’s because everyone is working so much, and on multiple projects at once, as is common with a small studio. I, Tyler, work primarily with the artists, where we’ve been bouncing between fixes and improvements to the new character art while at the same time making mage weapons, reviewing concept art for magic mortars, and working on BPOs (Building Placed Objects) and mage abilities. While the folks in Seattle were trudging through the snow or, in some cases, working from home (or not, if they didn’t have any power), we all still managed to get a lot done this week. On the engineering front, as mentioned, we’ve continued work on BPOs, siege scenario mechanics, improved ability system changes, and more! This all reminds me of waiting tables on a crowded evening… You’re so busy, then bam, suddenly the evening is over and your feet hurt! Christina ported fall damage and rubble collision damage to the improved system. This will give us the ability to do more with those damage types in the future. Christina also ported the slash commands to the improved system. Caleb optimized the data capture inside the scripting layer. This will allow us to create fancier abilities that are more performant. The first pass of importing the Winter Shadow, Forest Stalker, and Blackguard to the improved ability system has been completed by Anthony. Wylie has implemented all of the skill components for the heavy fighters and will be moving to the traits and shouts next week. WIP – Tech – Physics: Colin refactored PhysicsNetworkState to make our physics networking more flexible. This is needed for networking building-placed objects, such as wall torches and chandeliers, which Matt is currently working on. Tyler also worked with Matt to figure out how to set up the art assets such that we can add more assets in the future that will adhere to the blocks. WIP – Tech/Design – Ability Builder UI: James has made great progress on the ability builder. With the primary sections complete, he’s working on additional pieces. You can check it out in today’s update, below! The new design is really great, and we can’t wait to begin turning concept into reality! WIP – Tech/UI – Ability Bar: JB spent some time this week reworking the ability bar. Soon, players will be able to move the ability buttons and transfer abilities from the builder (once implemented) to the hot bar. WIP – Tech/Design – Trebuchet Ammo Types: Ben worked on flushing out the design for Realm-specific trebuchet ammo. This will let us create more abilities for the siege engine, as well as further differentiate the Realms’ abilities and visuals during large sieges later in testing. WIP – Tech – Live Scenario Scoreboard: AJ created a live scenario scoreboard and sent it up for review. 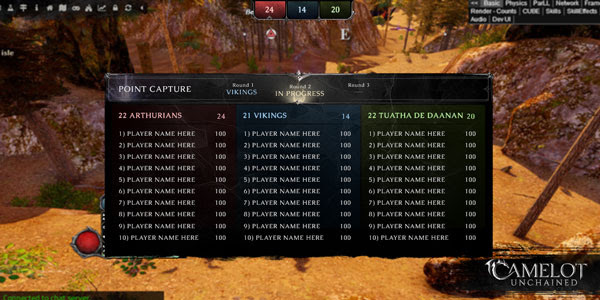 This scoreboard will allow players to see the scores of all the players and Realms in the scenario at the press of a button. It also will as add score HUD that will always be on the UI while in a scenario. Tech – Chat Improvements: AJ has made improvements to the chat window. You can now click on the Chat input to start typing, and left-clicking on a chat line of text will copy it to your clipboard. Art – Wands and Scepters: Jon and Dionne completed work on five wands for the Arthurian Flame Warden and scepters for the TDD Druid. These have been handed off to Ben to turn into items. WIP – Art – Wave Weaver Gauntlets: Michelle completed concepts for the last two of five gauntlets for the Viking Wave Weaver. Jon and Dionne have begun work on the in-game models, and will finish these up early next week. WIP – Sound – Scenario Music: DB started working on new music to accompany our new siege scenario, which Ben mocked up last week. WIP – Sound Effects – Mage Abilities: DB has finished the SFXs for the Flame Warden starter abilities. They are now ready for implementation by our engineers. WIP – VFX – Mage Abilities: Mike finished a first pass of the Flame Warden VFX. He’s continuing work on the other two classes. WIP – Art – Magic Mortar Concepts: We’ve completed several new concepts of our magic mortars, smaller, one-man deployable siege engines. We’ll get these in the hands of our artists to create next week! Auditing: Tyler continued to go through all the currently completed work, finding and fixing bugs. We’re planning on integrating this next week, where we will continue to look for bugs and further polish everything. Valkyries: We completed the undergarment set. LODs: We’ve completed most everything on the asset side, and plan to start integrating these in after Dave wraps up the supporting code. Animation and Weighting Polish: Sandra completed the three archer classes, as well as the Luchorpán variation. Joe completed the hair assets, and is working on further weighting polish. Scott completed further cleanup on the Physician, Empath, and Stonehealer. 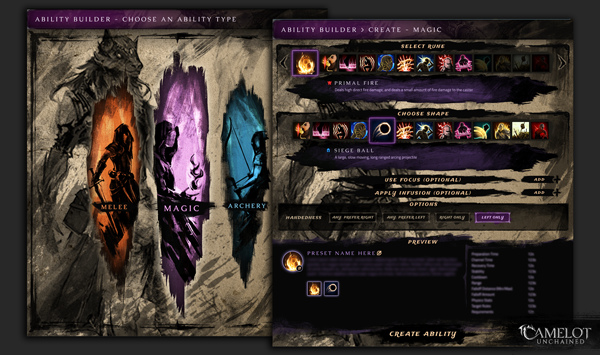 In terms of art this week, we start off with a WIP concept of the new ability builder UI. It’s created based on the concept of a kind of spellbook where you can create your own abilities. This is vastly different from the original that some of you Backers may have seen, and definitely way cooler-looking! The left side is ability type selection, the first page in creating an ability. The second is the main building page for a given type, where you select components and options for the ability to create. Next up, we have the new live scoreboard UI for scenarios. This will be accessible during the scenario, and you won’t have to wait for the final results to see who’s top dog! 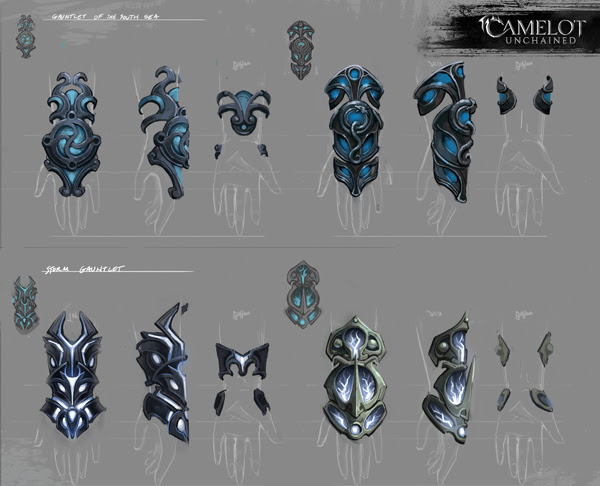 Michelle completed the last two Wave Weaver gauntlet concepts this week. You can see the previous three HERE, HERE, and HERE. 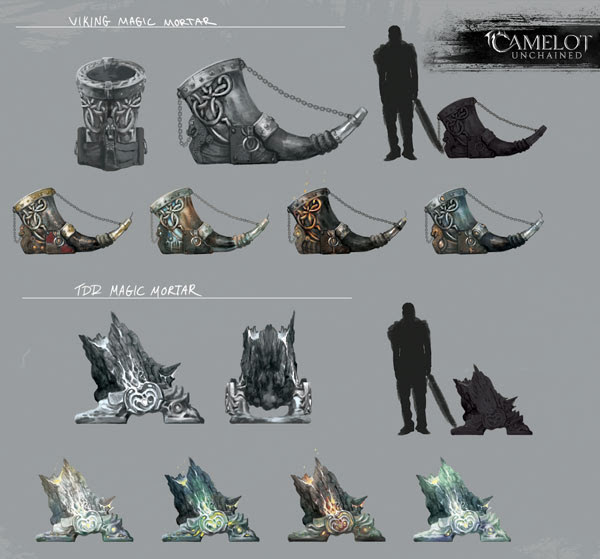 While we’re in the land of concept art, let’s take a look at the Magic Mortar concepts. First, we have the approved Viking version on top, and TDD on the bottom. We’re still working out the look of the Arthurian version, which should be figured out in time for next week’s update! During this week’s live stream Q&A, Mark goes into a little more detail about the magic mortars. You can catch that HERE. Lastly, we have the female TDD Fir Bog model from Jon. 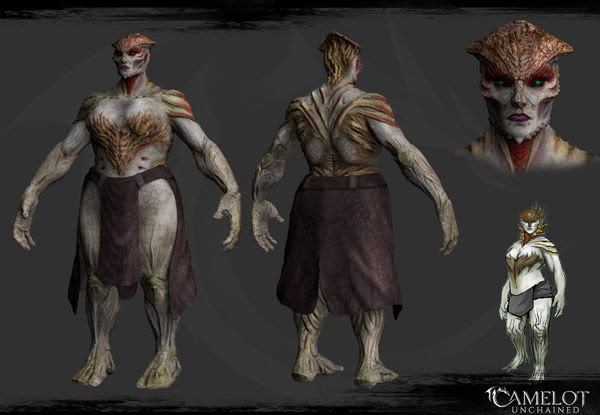 You can see the male version, with the male Arthurian Golem (another giant) HERE. As mentioned previously, we’re working ahead on the giant models for later implementation. And so ends this week’s update from your ever hard-working CSE crew. We’ve got a lot of cool changes coming up, and we’ll be excited to see you on the battlefield in a test!